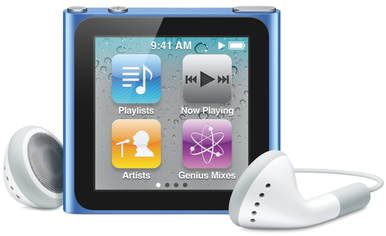 No iPod model has received as many makeovers—both minor and dramatic—as the iPod nano. (Perhaps not coincidentally, no other iPod model has sold as well.) The original nano was simply a scaled-down version of the standard iPod—tall and thin with a shiny, steel back and a white-plastic front, but the first revision gave the nano an all-aluminum body. The third version brought a short-and-wide shape, but the nano returned to tall and thin in the fourth go-round. The the most-recent nano, the fifth in as many years, got a larger screen and a video camera. But one thing all nano models have had in common is the traditional iPod design: a screen at the top with Apple’s iconic Click Wheel below. No longer. With the release of the sixth-generation (6G) iPod nano, the line has received its most dramatic redesign yet, and the Click Wheel is nowhere to be found. In its place you’ll find a Multi-Touch screen similar to—but much smaller than—the one on Apple’s iOS devices. The new nano, available in the same 8GB and 16GB capacities as before but in seven new colors, still wears an aluminum shell, but it now takes a considerably smaller shape: Instead of rectangular, it’s nearly square at just 1.5 inches tall and 1.6 inches wide. But the 6G nano is also the thickest nano yet—0.35 inches—thanks to a built-in, spring-loaded clip, a la the iPod shuffle. The clip is grippy enough to keep the nano attached to your shirt sleeve during moderate activity, though the nano is heavy enough that you’ll want to clip it somewhere safer during vigorous exercise. On the top of the nano are a Sleep/Wake button and shuffle-like Volume Down and Volume Up buttons. In fact, between its volume buttons, shape, and clip, the new nano looks very much like an oversized version of the new iPod shuffle. Well, except for the fact that it has no playback buttons. “No playback buttons? You mean this is another third-generation iPod shuffle debacle?” Not exactly. The front of the new nano sports a square (1.54-inch diagonal) LCD display with a resolution of 240 by 240 pixels. This display is quite a bit smaller than the 240-by-376-pixel display of the 5G iPod nano, but the new screen mostly makes up for its smaller size with Multi-Touch functionality: you control most of the nano’s features by touching the screen. If you’ve ever used an iPhone or an iPod touch, this touch-based interface will be familiar. You press the Sleep/Wake button to turn on the screen, and in place of the traditional iPod interface of hierarchical menus listing functions and media, you now see “app” icons floating over a user-configurable background (the nano includes different backgrounds based on the color of your iPod)—four icons per screen, with one icon for each major feature or category: Playlists, Now Playing, Artists, Genius Mixes, Radio, Podcasts, Photos, Settings, Songs, Albums, Genres, Composers, Fitness, Clock, Audiobooks (if you’ve synced one or more audiobooks to the iPod), and (if a microphone is attached) Voice Memos. You swipe the screen to the left or right to view another group of four, and you tap an icon to open that “app.” You swipe up and down to scroll lists of, say, tracks or artists. For many tasks, the Multi-Touch display and iOS-like interface are dramatic improvements over the older, Click Wheel-navigated menus. For example, scrolling through a long list of tracks or artists with a few flicks of the finger is as easy on the new nano as it is on an iPhone or iPod touch. You even get the same alphabetic index on the right edge of the screen that lets you quickly jump to, say, tracks starting with the letter R. If track information is too long to fit on the screen, a swipe to the left tells the nano to scroll that information. And during music playback, you can swipe left and right to switch the screen view between playback controls, playback options (repeat, shuffle, scrubbing, and Genius), and lyrics, all of which float over the current track’s album art. Similarly, some of the features that were present on previous nanos are now much more useful. Perhaps the best example of this is photo viewing: you flip between pictures by simply flicking your finger across the screen, and you double-tap to zoom in and out, just as you would on an iPhone. And tuning the built-in FM radio is much easier than before—you just swipe left or right to move the “dial” in large increments, making smaller gestures to pinpoint a particular station. And setting presets is as simple as tapping the star at the bottom of the screen. Another standout feature made possible by Multi-Touch is that you can rotate the nano’s entire interface, 90 degrees at a time, by placing two fingers on the screen and twisting clockwise or counter-clockwise. This is a great option that lets you view the nano’s screen “right-side-up” regardless of where the iPod is clipped or how it’s oriented. Finally, I don’t know if there’s better hardware inside the new nano compared to previous models, or if the new interface is just more efficient—or both—but the 6G nano is as spry as it is tiny. There’s no delay while the iPod “loads” a long lists of tracks, and there are no visual hiccups while scrolling long lists—a 2000-track list glides as smoothly on the iPod nano as it does on an iPhone. At 220 pixels per inch (PPI), the new nano’s screen is clear and easy to read—it has a higher pixel density than the screen on any iPod except the latest iPod touch. But the tiny size of that screen means Apple has had to take creative license with the iOS-style interface. For example, whereas most multi-screen iPhone apps feature navigation buttons at the top or bottom of the screen, there’s no room for such niceties on the nano. Instead, you usually switch screens by swiping the screen to the left or right. This is simple enough, but it’s not always clear when the gesture will work. For example, when viewing the Songs list, will swiping to the right take you back up to the home screen? (Answer: yes, but you only know this if you happened to have tried it previously.) Throughout the interface, the fact that there’s rarely a visual indication of when you can or can’t swipe means that you end up swiping to the left and right on every screen to see if anything happens. Similarly, when browsing lists, the small screen size means you see only three and a half entries—track names, artist names, and the like—at a time, so you end up swiping and scrolling a lot. (There’s no way to adjust the font size to be able to view more items at a time.) And the small screen means there’s not a lot of difference between a large “change screens” swipe and a smaller “do something on this screen” swipe—during my week with the nano, I often performed the wrong swipe, initiating an unintended action. And the new nano’s small size means that, unlike on iOS devices, there’s no physical Home button. Instead, if you tap-and-hold for a few seconds on an area of the screen with no controls, you return to the Home screen. But in many cases it’s easier to just swipe to the right as many times as it takes to get there. The big question, for me, is why the nano’s screen had to be so small. Given the existence of the iPod shuffle, there doesn’t seem to have been a compelling need for another as-small-as-we-can-make-it iPod, and a slightly larger design would have allowed for a larger screen. For example, a rectangular nano—perhaps the same width, just a bit longer, with a screen similar in size to that of the 5G nano—would have been considerably more useful, allowing you to view at least five items on the screen at a time, instead of three and a half, perhaps with enough room left over for more onscreen navigational aids. Of course, battery life would suffer a bit with a larger touchscreen, but the nano’s battery life is impressive enough that losing a few hours of playback time would be an acceptable compromise for many users. Multi-Touch screen out of the way, it’s worth running down the features from previous nano generations that are still here because, as I’ll get to in a moment, Apple has dropped a few notable capabilities this time around. Like its predecessor, the 6G iPod nano continues to support most common audio-file formats, including podcasts and audiobooks, and has an advertised battery life of up to 24 hours. (We’ll follow up later with our battery-test results.) It also lets you view photos synced via iTunes and, provided you have the right cable, output those photos to a TV—although photos synced to the nano are scaled down considerably. You can also use the new iPod nano for data storage. The nano’s clock feature still includes stopwatch and timer modes which, of course, you access by swiping to the left when viewing the clock. And provided you connect headphones with a built-in microphone, you can still record voice memos. The new nano also continues to offer accessibility features such as mono audio and VoiceOver—the latter being the feature that lets you, for example, hear information about what’s playing, and choose a playlist by listening to spoken prompts. However, as I’ll get to in a moment, you’ll need to purchase new headphones to take advantage of all the nano’s VoiceOver capabilities. New to the 6G nano is an inverted-color mode for “white-on-black” visuals. Finally, in my testing the iPod nano continues to offer good audio performance—assuming, of course, you feed it quality audio files. A devoted audiophile might quibble with the nano’s audio output compared to a higher-end component, but most iPod nano owners will be using the device on the go, and in that context, it sounds great.